Ah the joys of being a dancer, Ricki Lake is finding them out all too well. She was the first of the celebrity contestants on Dancing With the Stars to sustain an injury, but she says it will not cost her time on the dance floor. Congratulations to Ricki Lake! She has the prestige of being the first celebrity contestant on Dancing With the Stars to fall down on the job! 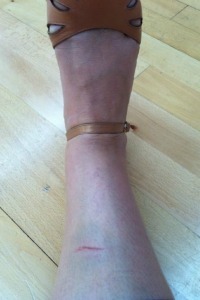 Okay we jest, but so did Ricki, when she tweeted a photo of her injury to her fans yesterday. Lake, 42, sustained a bruise that popped up on her shin during a practice with partner Derek Hough. Lake is considered a favorite to win the dancing competition. She has considerable dance experience, having played the role of Traci in Hairspray and doing all her own moves for the film. Dancing With the Stars celebrities have not always been lucky with their injuries. Just last year, Ralph Macchio hurt his knee so badly it jeopardized his chance at the mirrorball trophy, with him getting eliminated towards the very end of the competition. Kirstie Alley fell several times and her partner Maxim also sustained injuries as well. Singer Jewel had to bow out due to an early injury (she was replaced by rodeo husband Ty Murray) and Nancy O’Dell also sustained an injury that put her dancing career to an early end.